Håkull AS – Transport & Logistics - 70 years in service. It is a pleasure to inform that Håkull AS in 2016 is looking back on 70 years of operation. From its modest beginnings, with founder Mr. Kristen Håkull in 1946,followed by his son, Mr. Gudmund Håkull, who led the company for some decades (and still is active), and now Mr. Kjartan Håkull, third generation, is leading the company. It has, over the years, been a significant development in Håkull AS. In early stages, it was National services who stood for expansion and growth, until the end of the 1980’s when it was focused on bordercrossing transportation, Moving Worldwide and Shipping (Håkull Shipping AS, Oslo). The National service was sold out of the group in the end of 1980’s. Headquarters was developed in Sandnes, on various addresses, but first landmark terminal was built in Myklabergveien, Sandnes, completed in 1986, further to the current address in Stokkamyrveien 22, also in Sandnes a terminal which was completed in 1996. The servicepoint/terminal in Kristiansand has also been an important pillar of growth for many years (since 1974). Håkull Eiendom AS (Real Estate), with headquarter in Stokkamyrveien 22, is also a major property developing company in the region. Developed area per New Year 2016 which Håkull Property is controlling, partial or complete, is approx. 42,000 square meters. In recent years, the product range has been expanded with the establishing of Håkull Danmark A/S (2008) with new modern terminal in Nørresundby just north of Aalborg, a division which has shown significant growth in challenging times. The main product for the office in Denmark is traffic to and from Norway. Håkull Air & Sea AS has also been added to the product family of the company (2009) to fill this need in the Group and is an independent player in the market, also with residence in Stokkamyrveien 22 in Sandnes. 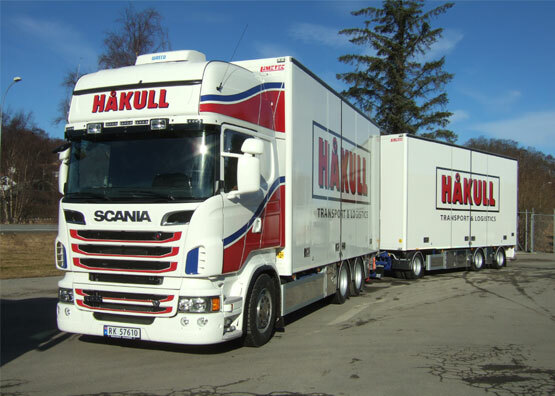 Håkull AS and Håkull Group are, and has been, a significant service provider to the industry in particular Southern and Western part of Norway, but also in Norway in general as regards to relocation and traffics from / to Denmark. In addition, we have a clear strategy to use mainly Norwegian and Danish Truck owners and drivers, something we know our customers value highly. This attitude is essential for us to continue. We are also closely associated with the Pan-European network International Forwarding Association (IFA) where we ensure our customers and our interests in Europe. Finally, and not least, we have dedicated personal with extensive experience and expertise, as well as the best sub-suppliers (Hauliers/drivers)! This is a "must" to succeed also in our further work towards our loyal customers, partners and for the future. It is a highly rising "jubilant", still privately owned by the Håkull family, which is well positioned in the somewhat challenging times we have currently.